Oh what a stinkin' cute set this is! 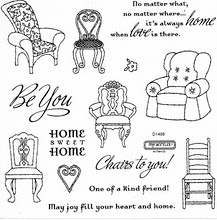 It's the CTMH May Stamp of the Month, Chairs to You. For the 3x3, I used the Wings Level 2 paper packet along with some matching embellishments (sweet leaf button, black waxy flax, and clear sparkles). The 6x6 is Mayberry Level 2, colonial white buttons, colonial white grosgrain, and a Smoothie bigger brad. Both are simple cards, but those chairs make them kind of fun!